Imagine a mono-hull lashed to trees on a side bank of a continental river. In a second moment imagine this same yacht sailing downstream, passing over sandbanks without touching ground. In the next moment, she is beating against head winds, getting the impacts of steep seas at the river's bar without loosing speed. Do you believe this boat exists? Yes! This is the Multichine 45 SK, a boat capable of crossing the strait of Drake in comfort and safety and, on another occasion, to sail over a coral reef unharmed. The MC45 SK is a new version of the Multichine 45 fin-keeler. With only some small changes, we designed this new yacht to be one of the most versatile cruising sailboats of our line of stock plans. Specified for steel or aluminium , for maximum strength, the MC 45 SK has a keel case placed at the central area of the boat, splitting the saloon in two halves. With 4.40 m maximum beam, it wasn't difficult to install the social area of the saloon to one side and the galley counter to the other. To port side is placed the L shaped dinette, and at the other side there is a complete galley with icebox, freezer, four burners stove with oven, and a large sink for maximum comfort. The access to the fore compartments is given by a corridor that separates the galley counter from the keel case. Next to the collision bulkhead that makes the aft wall of the anchor rode locker is placed a private double berth cabin. Abaft the cabin there is a single berth to starboard and an ample heads at portside with a shower box large enough to become a sauna, if wished. At the after quarter two cabins en suite with double berths complete the accommodations. Three separate cabins with the same number of heads, plus a bunk for a professional crew member, makes this yacht the best choice for charter business, or for a prived usage with ample possibilities of accommodating large crews with comfort and dignity. 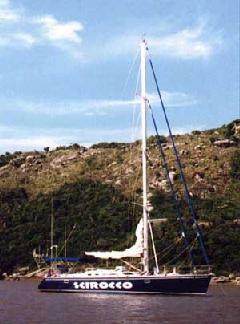 We adopted for the MC45 SK the same principles we employed in others of our swing-keel designs. We opted for a fixed rudder placed behind a skeg with an aperture for the propeller. This skeg is slightly deeper than the hull's maximum depth, which protects the propeller blades and reinforces the rudder stock. The keel lifting system employs spectra ropes tensioned by a hydraulic piston, so, in case of collision, the keel is free to lift, not bringing any harm to the equipment. Above deck we kept the same design as the MC45. In our opinion, such a stream-lined profile should be preserved, and doesn't require any changes.